What Is a Nurse-Ready Patient Room? If you have ever watched a duck glide across a pond, you would probably agree that they are elegant swimmers. They seem to float effortlessly while gently carving out pathways of water. Though what’s happening beneath the surface of the water is another reality. Under water, a duck’s legs and webbed feet are working hard and fast – back and forth – to continuously propel the animal forward. Turning over a patient room in the best way, so that it is ready for the nurses and their patients seems like it would be an easy task. But underneath the surface exists hard work from many supporting legs of the hospital to move the process forward. And they do not always get it right. In this post, I will cover what a nurse-ready room is, why it is so challenging and three levels of nurse-ready rooms to consider implementing. 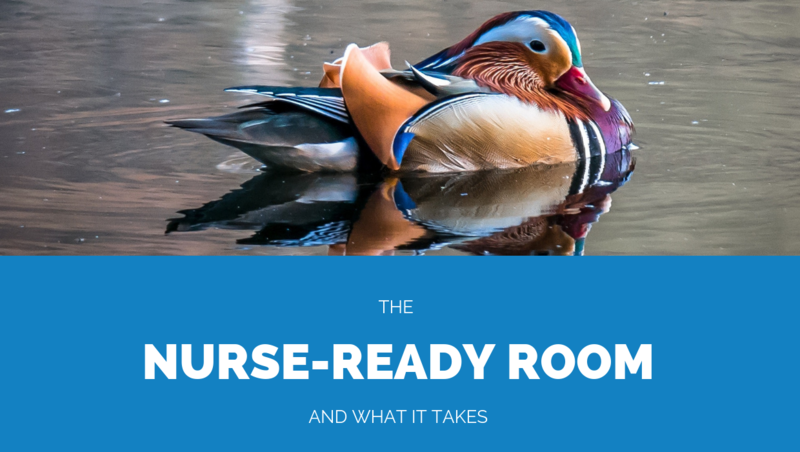 What is a Nurse-Ready Room? Picture this: You are a nurse who has confirmed via the bed board that the next room is ready for a patient. You walk into the room and are unpleasantly surprised by what you find. The room has only been half-cleaned, the previous patient’s belongings are still in the closet, an infusion pump is missing, and the list goes on. Once again, you are tasked with finishing a job that is not yours in the first place. Non-standard cleaning. No standardized cleaning practices exist, so it is left up to the individual and how he or she cleans. Insufficient equipment. One or more critical supplies are missing. Reactive room set up. Something is missing and someone (often the nurse) has to go fetch it. Varied operations. Everyone does their job differently because there are not any standards. Limited departmental metrics. No one is tracking metrics so they may not know how bad it really is. Poor partnership with support services. Groups have no way of working with one another so tension mounts. Inadequate space to care for patients. More burden on nurses to get the room ready on top of patient care. On top of this mess, nurses have minutes to confirm the patient’s medications, get an IV going, take vitals, and more. This is an incredibly stressful scenario for nurses. Now imagine instead that you are that same nurse, and you walk into the next room deemed ready for a patient. The room is spotless, the supplies you need are there and laid out for you just the way you like. You are able to focus 100 percent on your patient without having to worry about anything else because it is already taken care of. Sound better? Best-practice cleaning guaranteed. Standardized cleaning practices ensure accountability. The “right” equipment is always available. Collaboration between the nurses and support service teams guarantees the right supplies are always there as requested. Lean-standardized operations. Efficient and standardized operations mean everyone on every team knows exactly what to expect. Anticipatory room set-up procedures. Proactive systems mean less time searching for anything that is missing. Real-time operating metrics. Tracking metrics allows for making improvements as time goes on. Strong partnership with support service teams. Collaboration and accountability across all support teams. An environment that fosters complete focus on patient care! 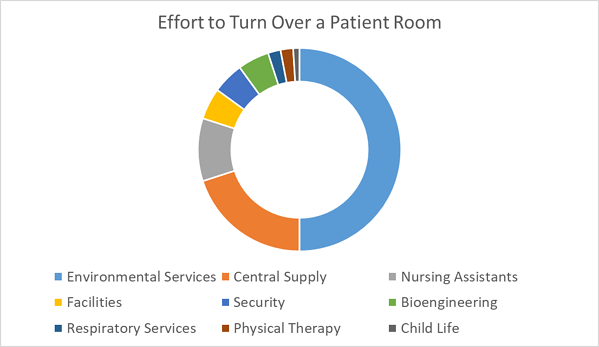 A nurse-ready room eliminates the workarounds nurses face every day in their jobs. These workarounds have become widely accepted at many hospitals, yet they detract from patient care and cause job-related stress and dissatisfaction. According to research, nurses experience an average of 8.4 work system failures per eight-hour shift. So, during an eight-hour shift, nurses are interrupted mid-task an average of eight times to essentially deal with workarounds. Other benefits to a nurse-ready room include practical advantages like minimizing patient infection rates by adhering to cleaning best practices. Research has shown that hospital-induced infections like C. difficile can trigger $42,316 in non-reimbursable costs to a hospital. Finally, when you optimize operations among the various support service teams that turn over patient rooms, you build relationships and accountability. This improves employee morale and increases productivity. Why is a Nurse-Ready Room So Hard? An outsider looking in might wonder what is so hard about preparing a patient room for a new patient. Environmental services is in charge of discharge and isolation cleaning. Material services/ supply chain is responsible for the delivery of equipment and supplies. Facilities oversees any issues with the room itself, for example, a broken clock. Security is tasked with patient valuables, if left behind. Clinical/bio engineering teams work on preventative maintenance for equipment. Respiratory services service ventilators as needed. Physical therapy brings mats, walkers, crutches, and so on. Nursing assistants get patient-specific equipment and supplies. Children’s hospitals have child life departments, too. Many teams are located in the basement, isolated from patient care. They are often understaffed because they are not revenue-generators. They are the lowest paid staff with highest turnover. Their performance is difficult to measure. All support departments operate independently despite a common goal. The result is that support teams are working hard, but often at odds with one another and unaware of nurses’ expectations. Level 2 is where we at ReadyList (my company) spend our time working with clients to achieve through our web application. Paper-based, room turnover checklists managed by the environmental services team to ensure all critical care and acute care rooms are prepared the same way, respectively. Clutter-free utility rooms with organized storage that is routinely maintained, so equipment and supplies can be found easily. This baseline level is actually better than what many hospital have implemented today. Technology-driven room turnover checklists are used by multiple support teams to prepare rooms by type of patient care. Equipment staging is aligned with the nurses needs, and proactively addressed ahead of time if something is missing. Metrics are available via the technology to drive improvement efforts. In this level, support services are enabled by technology to improve workflow and take on more responsibility related to their roles, so that the nurses are set up for patient care. Finally, Level 3 is the aspirational level. This level of readiness is rare, but some leading hospitals have implemented steps to include nurses in patient room design. This level is all about creating exceptional environments for nurse workflows and in the process, creating better environments for patients, too. These rooms are designed with nurse input in mind to support nurse workflow and patient care (e.g., nursing workspaces in just the right location to hold supplies that the nurse uses throughout the day). Nurses work hard. They need not have so many workarounds in their day to day. The nurse-ready room ensures they spend time doing what they are good at and enjoy: patient care. 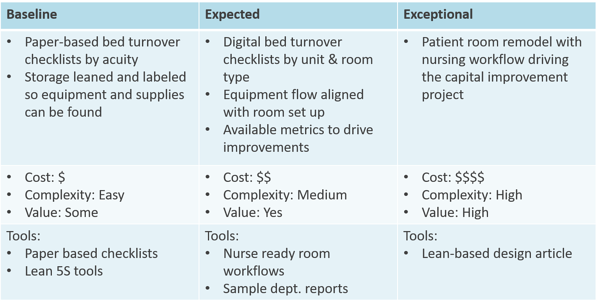 In my next blog, we will explore how to implement nurse-ready rooms in three stages, highlighting the gains you can expect by looking at one medical center’s experience. Brian Herriot is a hospital operations leader and CEO of ReadyList, Inc. ReadyList software ensures fully operational clinical environments to help clinicians dedicate more time to their patients.